Lesson 7: Who is the Promised Savior? The Old Testament tells us how sin and death came into the world through the disobedience of the first man, Adam. It also tells us about a wonderful Savior, whom God promised to send to us. This promised Savior is called "the Christ," which means "the anointed One"—the One anointed by God to be our Savior. Out of all the people who have ever lived, how can we identify "the Christ," the promised Savior? From the prophet Isaiah and other prophets we learn that the promised Savior would actually be God coming in human form. Isaiah wrote, "For unto us a child is born, unto us a son is given…and His name shall be called…The mighty God…" (Isaiah 9:6). If God did indeed become a Man, then it means that in this world, among all the people who have ever lived, there is one person who is not only a man, but God as well. His coming into the world must be miraculous. He must claim to be God. He must be able to do things which only God can do. He must tell us and show us what God is like. "Therefore the Lord Himself shall give you a sign; Behold, a virgin shall conceive, and bear a son, and shall call His name Immanuel" (Isaiah 7:14). The word "Immanuel" means "God with us." This child promised by God would be God coming to live with us. Jesus was indeed a miracle child because He did not have a human father. His mother, Mary, was a virgin, a pure unmarried woman who had never had sexual relations with a man. God sent the angel Gabriel to Mary to explain this to her. Mary asked how this could be, since she was a pure virgin. The angel said, "The Holy Spirit shall come upon you, and the power of the Highest shall overshadow you: therefore also that Holy One which shall be born of you shall be called the Son of God" (Luke 1:35). That Baby born to the virgin Mary was God in a human form. He was not born in a palace, but in a stable. The angel of the Lord appeared to shepherds in a nearby field and said, "Fear not: for, behold, I bring you good tidings of great joy, which shall be to all people. For unto you is born this day in the city of David [Bethlehem], a Savior, which is Christ the Lord" (Luke 2:10-11). If he is God, he must declare boldly that he is God. As we look back through history, we find that the major religions of the world were all founded by men. Did any of these men claim to be God? No, they did not. Abraham is the father of the Jewish religion. He was strong in his faith in God, but he never dared to call himself God. Hinduism is one of the oldest religions in the world, but no one in this religion ever claimed to be God. Confucius is the man who founded the religion that bears his name. He wrote several books but he never claimed to be God. Sakya Muni, the founder of Buddhism, did not believe in the existence of God. Since he did not believe in God, he never claimed to be God. Mohammed founded a religion which has millions of followers worldwide. Mohammed believed in one God, whom he called "Allah." Mohammed said that he was the prophet of Allah, but he never claimed to be God. "Have I been so long time with you, and yet have you not known me, Philip? He that has seen Me has seen the Father…Believe Me that I am in the Father, and the Father in Me…" (John 14:9,11). On another occasion, Jesus said, "I and My Father are one" (John 10:30). What was the response of the religious teachers to His statements claiming to be God? They took up stones to kill Him. They said, "…you, being a man, make yourself God." Why was Jesus crucified? He was hated and crucified because He claimed to be God. Many people hated Jesus when He was here on earth. The religious leaders hated Him because He claimed to be God. They tried to trip Him up in His words, but Jesus asked them, "Which of you convinces [convicts] Me of sin?" 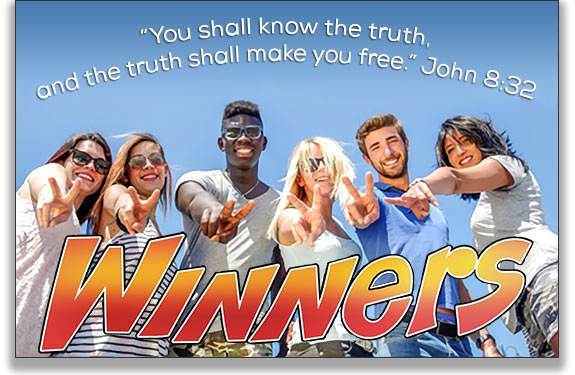 (John 8:46). No one could point to a single sin in his life. Jesus never had to apologize to anyone because He never wronged anyone. He was sinless. 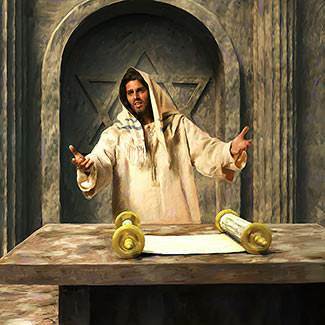 Speaking of His Father, He said, "…I do always those things that please Him" (John 8:29). Twice the Father spoke from Heaven, saying, "This is My beloved Son in whom I am well pleased" (Matthew 3:17; 17:5). On one occasion Jesus was in a small ship with His disciples. Jesus lay down and fell asleep. While he was sleeping a great storm arose, so that the ship was covered with waves. The disciples were filled with fear. They woke Jesus saying, "Lord, save us!" Jesus spoke to the wind and the sea saying, "Peace be still." Immediately the wind and the sea became calm. 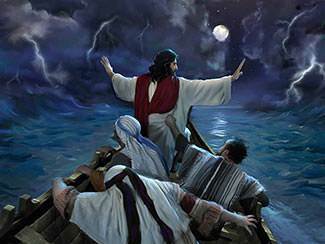 The disciples marveled and said, "What manner of man is this, that even the winds and the sea obey Him!" (Matthew 8:27). Jesus had power over evil spirits. The evil spirits recognized that He was the Son of God, and, when He commanded, they obeyed Him. Jesus had power to heal all sicknesses and diseases. He caused the lame to walk again. He restored sight to the blind. Jesus had power over death itself. Because He is God, He had the power to do what no man can do—He raised three people from the dead. One of these was His friend, Lazarus, the brother of Mary and Martha, who lived in Bethany. 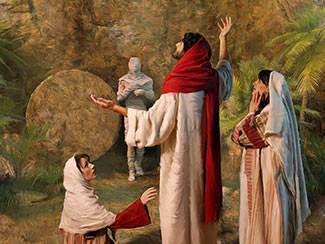 One day Jesus received an urgent message from Mary and Martha telling Him that Lazarus was sick. When Jesus arrived in Bethany, Lazarus had been dead for four days. Mary and Martha were heartbroken. 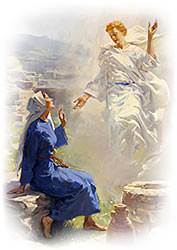 Martha said, "Lord, if You had been here, my brother would not have died." Jesus said, "Your brother shall live again…I am the resurrection and the life: he that believes in Me, though he were dead, yet shall he live" (John 11:23,25). At the tomb, Jesus cried with a loud voice, "Lazarus, come forth!" Lazarus came walking out of the tomb in his grave clothes. God wanted us to know the truth about Himself, so He sent His Son into the world that we might know what He is really like. The Bible says, "No man has seen God at any time; the only begotten Son, which is in the bosom of the Father, He has declared Him [shown us what He is like]" (John 1:18). Jesus taught us and showed us that God loves sinners. He loves us so much that He does not want to lose us forever. The Bible says that God "is not willing that any should perish, but that all should come to repentance [turn to God]" (2 Peter 3:9). What is God like? He is like Jesus! The Lord Jesus said, "He that has seen Me has seen the Father." This is a most wonderful thing. The eternal, invisible God has been here on this earth. There is no need to wonder what God is like, for He has revealed Himself to us in His Son. The Bible says, "God was manifest in the flesh…" (1 Timothy 3:16). Jesus was anointed by God as the promised Savior. Of all the people who have ever lived, one Man was anointed by God as "the Christ"—the promised Savior. That Man is Jesus! The Bible says, "…God anointed Jesus of Nazareth with the Holy Spirit and with power: who went about doing good, and healing all that were oppressed of the devil; for God was with Him" (Acts 10:38). When did this anointing take place? It took place when Jesus was baptized. 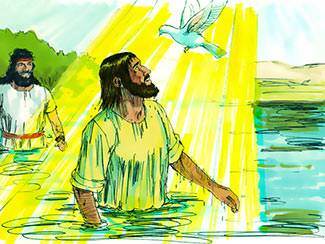 When Jesus came up out of the water, the heavens were opened, and the Spirit of God in the form of a dove came down and lighted upon Him. A voice came from the Father in Heaven saying, "This is My beloved Son, in whom I am well pleased" (Matthew 3:17). Out of the billions of people in all of humanity, you can point to Jesus and say without a doubt, "This is He—the Christ, the One anointed by God. This is the promised Savior! This is the One who is both God and man." Since Jesus Christ claimed to be God, there are only three possible answers to this question: 1) He is a liar, 2) He is a lunatic, or 3) He is who He said He was—God. Is Jesus Christ a liar? When you examine the pure, sinless life of this Man, can you say that He is a liar? No, you cannot. Is Jesus Christ a lunatic? Are His words and teachings the words of a madman? No, they are not. Even His enemies said, "Never man spoke like this man" (John 7:46). This leaves only one answer: Jesus is who He said He was. He is "the Christ"—the One who is both man and God. Jesus said, "…if you believe not that I am He, you shall die in your sins" (John 8:24). The most important question that Jesus ever asked His disciples was this: "Whom do you say that I am?" Simon Peter answered, "You are the Christ, the Son of the living God" (Matthew 16:16). Jesus said to Peter, "Blessed are you, Simon Bar-Jonah: for flesh and blood has not revealed it unto you, but My Father which is in heaven" (Matthew 16:17). "These are written, that you might believe that Jesus is the Christ, the Son of God; and that believing you might have life [everlasting life] through His Son" (John 20:31). God promised to send a wonderful Savior to us. He is called "the Christ," which means "the anointed One." Of all the people who have ever lived, only one Man was anointed by God as "the Christ." 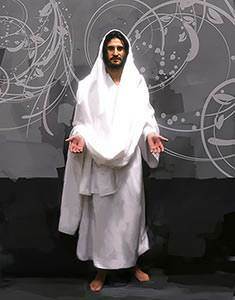 That man is Jesus of Nazareth, anointed by God as the promised Savior. Jesus Christ is absolutely without a rival! There are many religions, but there is only one Person who is both God and man. There is only one Person who died for our sins, and rose again to be our living Savior and Lord. That Person is the Lord Jesus Christ. God had promised Abraham and Sarah that they would have a son in their old age and would call him Isaac. He would be a miracle child because Abraham was 99 years old at this time and Sarah was 90 years old. Sarah had always been barren and now she was past the age of childbearing. But God fulfilled His promise to Abraham and Sarah. The Bible says, "The Lord visited Sarah as He had said…for Sarah conceived, and bore Abraham a son in his old age…" (Genesis 21:1-2). Isaac is one of the clearest types or "pictures" of Christ in the Old Testament. Isaac was "a miracle child." Humanly speaking, it was impossible for Sarah to bear a child; yet she bore Isaac, the son which God had promised to them. 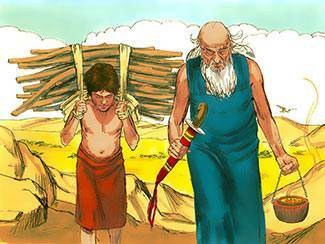 When Isaac was old enough to be weaned, his father Abraham made a great feast to honor him. All of Abraham's servants honored Isaac except one person—Ishmael, the son which Abraham had fathered by the slave girl, Hagar. Ishmael was mocking Isaac and making fun of him. When Sarah saw Ishmael mocking Isaac, she demanded that Abraham send the slave woman and her son away. This was grievous to Abraham because he loved Ishmael. But God said, "…hearken unto her [Sarah's] voice; for in Isaac shall your seed be called" (Genesis 21:12). Isaac was especially loved by his father, but as Isaac grew older, a time came when God tested Abraham's faith. God told Abraham to go to a certain mountain and offer his son Isaac as a sacrifice. When Abraham came to the place God had told him of, he built an altar, laid wood on it, bound Isaac his son, and laid him on the altar. 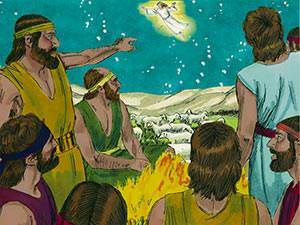 Isaac knew now that he was to be "the lamb" for the burnt offering, but he did not protest. He was willing to die if that was God's will. This scene is a picture of what God did for us. Abraham was a type of the Father, who "spared not His own Son, but delivered Him up for us all." Isaac is a type of Christ who was obedient to His Father unto death. 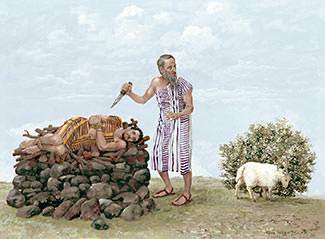 The ram which was offered as a sacrifice in Isaac's place is a type of Christ who offered Himself as a burnt offering in our place. When Abraham took Isaac off the altar and held him in his arms, it was a picture of Christ being raised from the dead. God spared Abraham's son, but He did not spare His own Son. The Bible says that He "spared not His own Son, but delivered Him up for us all" (Romans 8:32).